The LAC Regional webinar on MPTs provided a general overview of MPTs, and contextualized the need for MPTs within regional epidemiological data and the social realities faced by LAC women. 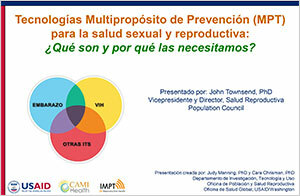 It served as an initial step in engaging LAC-based sexual and reproductive health stakeholders in the IMPT’s work, and provided Spanish-speaking colleagues an opportunity to learn more about the MPT field. The webinar was co-hosted with the Reproductive Health Supplies Coalition (RHSC) ForoLAC, featuring John Townsend (Population Council), Kimberly Cole (USAID), and Milka Dinev (RHSC ForoLAC). *Please note that Milka Dinev's presentation on the social context of MPTs for the LAC region is not available in English. Townsend, J. & Cole, K., & Dinev, M.